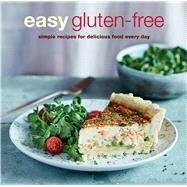 Eating a gluten-free diet needn’t be a challenge. In this collection of recipes you’ll find a dish for all occasions from a dinner party to afternoon tea. Choose from sustaining Breakfasts including Buckwheat Pancakes and Quinoa Porridge. Simple Snacks such as Sausage Rolls, Lentil & Spinach Pasties, and Fresh Fava Bean Falafel are not only great for sharing at picnics but also a real treat to enjoy at home. Ideas for Light Meals range from Salmon Cakes to Seared Beef Salad. Cooking for guests will be a breeze with comforting recipes such as Polenta Puttanesca and Pork Stroganoff. Desserts include a Raspberry & Redcurrant Roulade, Peach Cobbler, and Black Forest Pavlova. There’s an invaluable section at the front of the book with information on how to avoid cross-contamination in your kitchen, the very best ingredients to include in a gluten-free pantry as well as tips for getting the best baking results every time. With delicious new ideas for gluten-free recipes, as well as alternatives to traditional family favorites, this book will enable you to create delicious free-from food at home that everyone can enjoy.